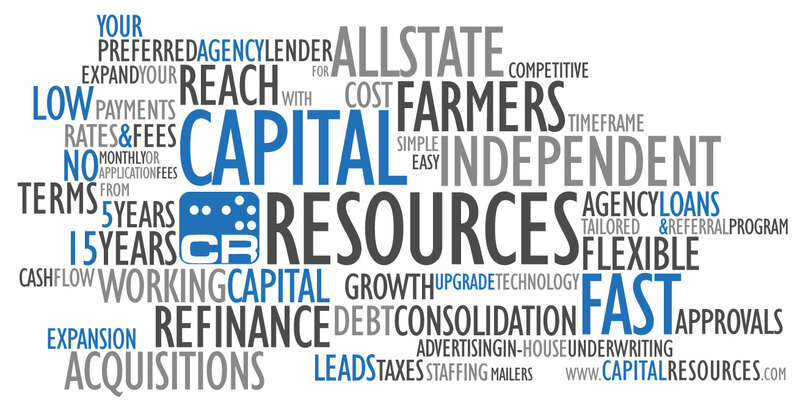 Simplify the Process of Securing an Insurance Agency Loan with Capital Resources. What is your primary objective/reason the loan. What costs will be associated with a new loan? What will the new loan payment be? How much of my valuable time will this take? Defining your objective is arguably the most important part step in your decision-making process. Your objective will affect how you prioritize the importance of cost, loan payment, and time considerations. Once you have clearly defined your primary objective, this should help you to prioritize cost, loan payment, and time. When considering a loan, many people focus almost exclusively on costs. The variables most commonly spoken of that affect the overall cost of money include Loan Origination Fees and Interest Rates. However, many lenders advertise little or no origination fees, but have costs not advertised including application fees, underwriting fees, servicing fees, loan document preparation fees, legal fees, prepayment penalties, and more. This occurs with banks, finance companies, exclusive agent lenders, and SBA lenders. Money is a commodity and the market generally dictates how money is priced. This means, most lenders price money very similarly overall. For most business owners, personnel costs and debt service are the two biggest expense items on their income statement. Therefore, many consider the loan payment to be the most important variable to consider when evaluating loan options. As a rule of thumb, the longer the term of the loan the lower your monthly loan payment. The tradeoff is the longer the loan, the higher the interest usually is. It can be difficult to find the balance between overall costs and monthly loan payment. Setting your primary objective and sticking to it, can help guide you to identify that balance that works best for you. Time can be a huge determining factor for many when contemplating a loan. Do you need your working capital immediately? Or are you willing to wait 3-6 months for your money? When considering a lender, you are likely to consider one who is a bank or a finance company. Compared to finance companies, banks are very slow. If you are considering a bank that requires a loan guaranty from the SBA then expect the process to be even slower than a bank that will originate the same loan without a SBA guaranty. For example, a bank that is highly efficient in originating loans with the SBA will consider closing a SBA loan in 45 as very fast. In contrast Capital Resources is able to fund a loan within 1 day of it being approved. The ability for a lender to get their customer the money they need, when they need it, is often determined by how specialized the lender is. Today, technology also is a major factor in how quickly you can secure the funding you are in search of. The more technology deployed and industry expertise that exists within a lender means less time you spend educating your loan officer and waiting for packages to be shipped back and forth. Set your objective first then prioritize how important cost, monthly payment, and timelines are. Money is a commodity and most lenders have very similar pricing models, but vary in how they market and disclose them. This leaves the biggest differentiation among insurance agency lenders today are monthly loan payments and speed. At Capital Resources, we hope you’ll give us the opportunity to help you meet your primary objective while keeping your loan priorities in order as well. Are you thinking about buying an insurance agency? Here are some things to consider. Evaluating Your Options When Choosing a Lender for Your Insurance Agency.